This beautiful concoction has tons of healthful and detoxifying phytonutrients, which are simply, the specific qualities that we associate with how any plant food looks, smells and tastes. Basically, all the senses that will make you want to inhale the stuff. To be honest- I’ve made three batches of this in as many weeks. Pretty soon, I’ll be like Pavlov’s dog and will start salivating when I hear the blender. I love that this recipe is a quick way to dress up any meal. The Vitamix Personal Cup Adapter makes it so easy. You don’t have to chop anything- and the personal cup is a perfect serving and storing vessel for the leftovers. 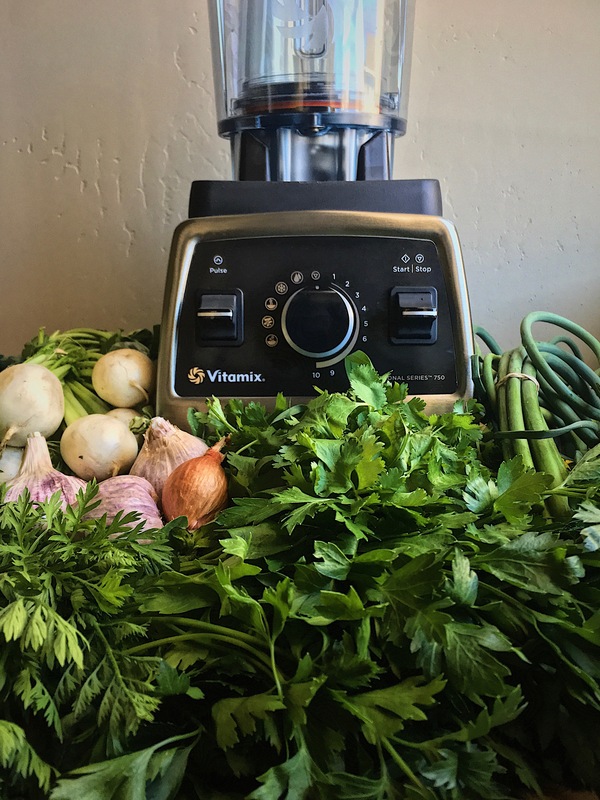 The Vitamix Personal Cup Adapter works with the legacy machines and it allows you to make 20oz servings of smoothies, dressings, sauces - you name it. The adapter comes with 2 cups and they even have to-go lids! Here, I drizzled the Chimichurri straight from the cup onto all the grilled summer goods. I have since eaten eggs, rice, and grilled salmon- which were all bestowed the honor of this beautiful sauce. It only gets better after day one- when all the flavors meld with the sole purpose to flavor your life. Directions: Preheat oven to 375. Chop the top off the garlic bulb(s), peel the skin off the shallot- coat them both with the oil + and a pinch of salt. Roast in oven for approximately 1 hour. Directions for the Sauce: Combine all ingredients in the Vitamix Personal Cup. Attach the adapter, place on blender base and pulse on a medium speed until just chopped. Note: I enjoy this Chimichurri texture as “just chopped” and not entirely blended. It has the quality that almost looks like you had the exceptional patience and diligence to finely chop all the ingredients yourself and didn’t have to.